While watching the recent documentary on Los Angeles’ Sound City, I almost passed out in shock when I realized that 1991 was 22 years ago. It’s not that 22 years is such a long time, it’s just that the 22 years in between seem both incredibly recent and at the same time, so very distant. As a somewhat related example, Nirvana’s Nevermind came out 22 yeas ago this coming September, which means more time has elapsed between that album’s release and today than has elapsed between the Beatles’ Let It Be and Nevermind. Not sure if that comparison is worthwhile, but it does lend a bit of surprising perspective. Nevermind was the album that finally clued everyone else into what all us skinny, angry, somewhat affected “alternative” types had been mumbling about for years. It was also the album that all us skinny, angry, somewhat affected “alternative” types adored instantly, then hated when everyone else adored it, and then realized it was so good that we could go back to adoring it without losing too much street cred. Listening to it again today, Nevermind still sounds like something happening, it still sounds incensed, exhilarated, desperately beautiful, and calmly disturbed, so maybe 22 years wasn’t so long ago after all. 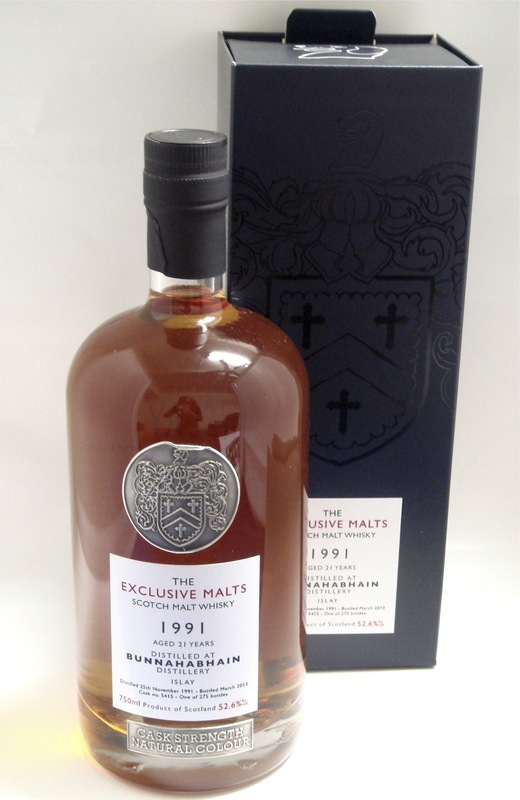 Ok, yeah, so other than the fact that this Bunnahabhain was distilled in 1991, there’s pretty much zero connection between this independently bottled release and Nirvana’s music industry-changing release. This American oak-matured expression from the Creative Whisky Company’s Exclusive Malts range was bottled at cask strength, in its natural color, and made its way to the U.S. this summer. The Nose: Beautiful nose filled with rich dessert notes but also a little delicate at the same time. Salted caramel, dark chocolate covered cherries and cherry cola, baked rice pudding with raisins, vanilla bean ice cream, sweetened malt – think malted milk balls even, and a little cinnamon roll cinnamon. Some coastal notes help to balance all that sweetness, wet wood, sea spray, and just a slight hint of peat smoke. With water, much of those sweet dessert notes are toned down and those complex maritime elements and the delicate peat smoke are played up more. The Palate: A sharp, almost tingling entry. Crisply sweet with some citrus now along with slightly winey-y grapes. Baker’s chocolate and nutty toffee along with a bit of salted malt (does that exist?) lead to quite dry, quite mouthwatering, tannic, resinous wood notes; greenish clove, bitter cinnamon. Growing throughout, albeit quite quietly, is more of that briny peat smoke which shows itself more towards the end. The palate holds up beautifully with water, losing none of its complexity, instead just stretching it all out, giving that coastal sweetness and spice room to breath. The Finish: Lingering and complex, salty and slightly raisin-y with tannic wood notes of vanilla bean and clove. A very nice, subtle wisp of briny, peaty smoke trails off at the end. Thoughts: A fairly beautiful whisky, definitely a complex one with many delicate layers, I think it would take some time to really get to know it, but that would be time well spent. The nose comes off quite sweet but luckily that Bunnahabhain maritime character provides a welcome counterpoint. Much of that carries over to the palate where the sweetness and salt help prevent it from being too woody. With water, there’s even more balance and more space given to let all the elements make themselves known. It seems hard to be disappointed by Bunnhabhains of this age, this one is certainly no exception. Definitely recommended.